Despite high hopes and enthusiastic attempts, Mobile TV isn't popular with users in the UK. And while the lack of compelling content is a key reason, another is availability. There's an ongoing debate on whether to adopt a single technical standard in the UK and Europe. "Mobile TV services will benefit from being broadcast across European states, but before that can happen we need to agree on a common standard," said Christophe Forax, a spokesperson for the European Commission. Forax was speaking at the 'Mobile TV - hit or miss?' forum in London. Unsurprisingly, Forax said that the Europe-developed DVB-H standard was likely to become the standard among European countries, adding that "a consultation on the best standard for Europe won't be needed if "enough countries choose DVB-H.
"The EU will not propose to regulate a standard - only if it's necessary," Forax said. This sounds a lot like, 'choose whatever you want, as long as its DVB-H'. 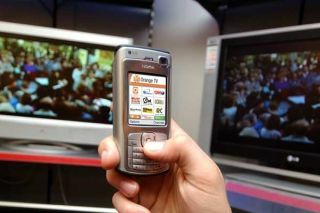 BSkyB, already a key player in UK mobile TV services, disagreed. "We are strong believers that mobile TV and video services will grow if investment and development is allowed to continue at own its pace," said Sheila Cassells, head of economic policy at BSkyB. "No regulation is needed, it will just delay the whole project." DVB-H isn't the only mobile TV technology in town. Sky ran its own mobile TV project earlier this year using the MediaFLO technology from Qualcomm. While the regulation of mobile TV is certainly an issue for mobile TV providers, it's not something that the prospective mobile TV user will be giving two hoots about. Ultimately, consumers won't care what the standard is as long as that standard works, the content is good and mobile TV is easily and widely accessible. Juniper Research suggests that we won't see decent mobile TV services in the UK until 2010. But there's an obvious desire to get mobile TV services in place in the UK by 2008. Just in time for the Beijing Olympics and the European Football Championships. "2008 is a crucial year for sport," says Sky's Sheila Cassells. "We want to see [mobile TV services] up and running by then, and be stable enough for people to watch the Olympics on their mobile only," she said. But while 2008 provides a workable deadline for mobile telly providers, there is an advantage to being late to the party. "There's a real opportunity for the UK as a late adopter of mobile TV," suggested Barry Flynn, principal consultant at TV technology consultancy Farncombe Technology. "We'll be able to find out about different business models, problems, and manufacturer/operator responsibilities before the services really kick off."